ACT Prep- Improve Your ACT Scores! Register with Mr Beneke at brett.beneke@raypec.org Cost is $25. Register Now for the ACT Test! *NO PURCHASE OR ACT TEST REGISTRATION NECESSARY. Sweepstakes subject to complete Official Rules. The Princeton Review ACT Course is not a replacement for 2-3 years of math/English classes. It is an opportunity to refine and apply the skills from past classes and pair them with proven test taking strategies. Skill Building Sessions: After school skill building sessions will prioritize how to most efficiently approach the test and prepare for common question types. After baseline skills are established, the priority shifts to student identification of strengths and weaknesses. During those stages, students are expected to follow a guided process that lets them build on strengths and mitigate weak areas by using the skills from the readings and practices. ​Practice Tests Two proctored practice tests are offered as a preview opportunity for students. Participants should treat them as actual test dates and arrive 15 minutes before the test begins at 8:00 am. There is not a magic word or phrase that can be said that lets students suddenly jump 3 points without the effort. Doing the out-of-class drills and taking the practice tests seriously are necessary components for a student intending to raise their score. Attendance Participants are expected to be present and engaged for every session. Given the accelerated nature of the course, any missed time is a missed opportunity and is considered neglect of a Necessary Component. Do students have to attend every session of a course or just one? The expectation is that students attend each of the seven sessions that make up a course. We will focus on separate parts of the test during each session. However, attendance is not mandatory. It is acceptable for students to attend when they can as long as they have paid. What should students bring to the class? Students should bring two #2 pencils, a calculator, and their test books. Can students take the prep class more than once? Yes, students can take the class as many times as they wish, and there is no additional charge for taking the class a second time. We do recommend that students take the prep class just before the ACT test that they have registered for. Varsity Tutors offers Free ACT Resources for students to practice and learn necessary skills for ACT tests. Follow the link and set up a free account. Each day ACT posts a new question for the day. Click on the button to see what questions you can answer correctly. Go to the Learning Express Library to access practice ACT, SAT, AP and other college preparatory tests. Create an account using your RP login username and password. Good luck! ACT Test Prep Resources: Check ACT's ACT Test Prep resources on their website. Question of the Day, sample questions, test taking tips, test day reminders, and more! MARCH 2 SUCCESS: Free test-taking resource available for students The U.S. Army Recruiting Command is helping prospective recruits and other students improve their test-taking strategies and math, science and English skills through March2Success, a free Web-based program. With a curriculum designed by Kaplan and Educational Options, Inc., the program is proving successful according to teachers and students using it. Participants may select part of all of the sections offered though March2Success, and are free to repeat lessons. March2Success is available at www.march2success.com. Registrants may request recruiter contact through the site; however, they are not required to do so and will not be contacted without request. Click the button below to compare the difference between the ACT and SAT tests. The lower number is for the 25th percentile of students who enrolled in (not just applied to) the college. For the school above, 25% of enrolled students received a math score of 21 or lower. The upper number is for the 75th percentile of students who enrolled in the college. For the above example, 75% of enrolled students got a math score of 27 or lower (looked at another way, 25% of students got above a 27). 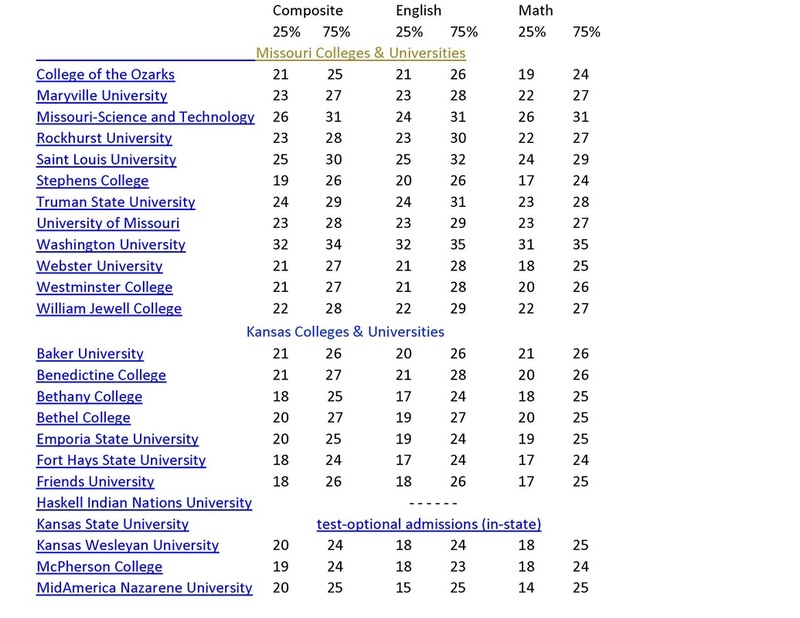 For the school above, if you have an ACT math score of 28, you would be in the top 25% of applicants for that one measure. If you have a math score of 19, you are in the bottom 25% of applicants for that measure. Understanding these numbers is important when you plan how many colleges to apply to, and when you figure out which schools are a reach, a match, or a safety. If your scores are below the 25th percentile numbers, you should consider the school a reach. Note that this does not mean you won't get in -- remember that 25% of students who enroll have a score that is at or below that lower number.